Bundled apps in Windows 8, there are many new Metro apps revealed by Microsoft for Windows 8. Microsoft displayed few growing ideas into action in Windows 8. The very new Windows 8 Consumer Preview operating system comes up with new exciting features like Windows store, Mail, Photos, Contacts, Calendar and more. However, today I am going to talk about the Windows 8 Calendar App. 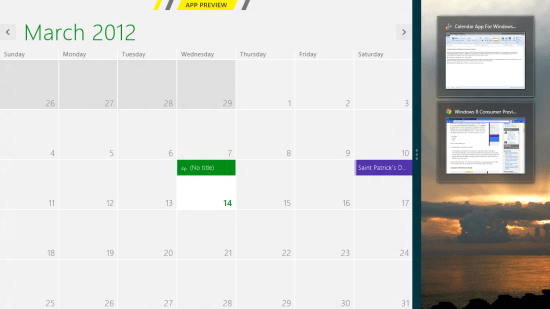 The new dashing Windows 8 Calendar app with an exciting new look is very much similar to Google’s and Apple’s interface. 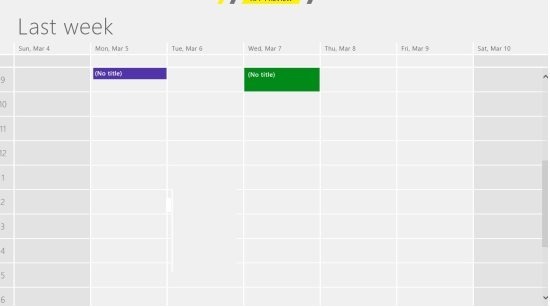 This Windows 8 calendar app is much like a wall to its new feature which makes going through your daily, monthly and weekly appointments like a breeze. Also, check out our post on Windows 8 Keyboard Shortcuts. You can easily view the month, date and year. The calendar is displayed on full screen mode with resolution of 1024 pixel. You can easily switch to next or previous month with a scroll-bar on mouse or click on top left and right arrows to switch over months. You may also add any specific details for current date. You can also set reminders for your appointments with the timing schedule. 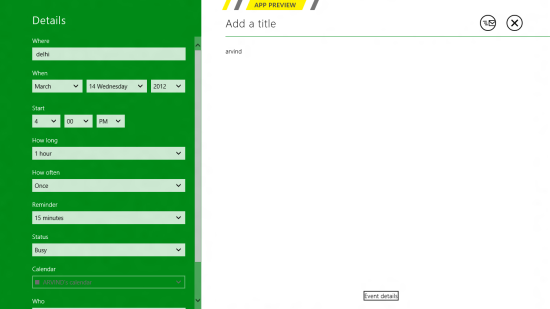 You can even add message and Blog posts to Windows 8 calendar. Send invites to your friends with current dates details on their Email address. All listed holidays are already mentioned in calendar app. All you have to do is switch to start menu on Windows 8 and type “Calendar”. Click on “Calendar app” to open it. Windows 8 calendar is launched in front of your screen. You need to sign in with your Windows Email Id. Now, click on any date add web blog, messages or title on it. Add remainder monthly or weekly basis. You can schedule your appointments with this calendar app. You can add even birthday remainder on calendar and send invitation through mail. This app has excellent layout patterns. 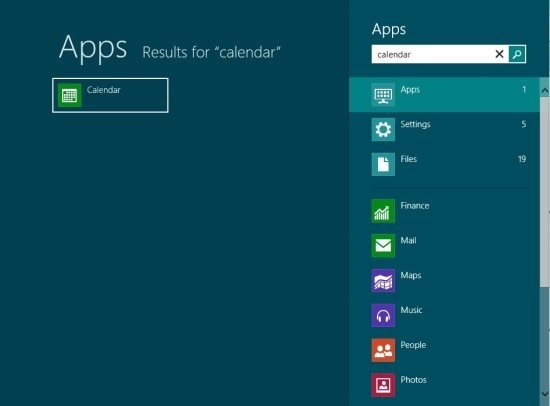 Go ahead and try the Windows 8 Calendar App yourself to look for some additional features or drawbacks. Seems an inspiration for Windows 8. Doesn’t sync with Google Calendar. No thanks. VueMinder is much better and runs perfectly on Windows 8. But it doesn’t print. Not a good release. I can’t schedule recurring events for anything other than once a day, once a week, or once a month. That is so mind bogglingly useless that I have to get a different app for a simple calendar just so I don’t have to put a bi- weekly event in day by day. This is quite possibly the worst attempt at making a calendar in human history. Calendars have been around for literally thousands of years. And here comes Microsoft trying to “improve” the experience by adding a log-in screen and a 10 second loading screen. Wow. I cannot believe the stupidity that went in to making Windows 8.